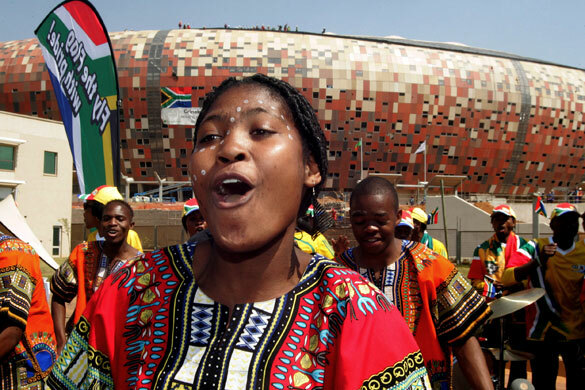 For the nearly 50 million people of South Africa, the 2010 World Cup represents an opportunity to show the world its progress through sports. But for a new nonprofit organization, soccer’s biggest stage also offers an opportunity to publicize young women who tend to go unheard. Global Girl Media, an educational nonprofit founded in January 2009, aims to use the games to empower young women by teaching them about digital media. Its first project, called “Kick It Up!” will teach about 20 disadvantaged South African teenagers to report on the Cup, and will also encourage them to tell stories about their lives. The girls will be trained by South African journalists, sportscasters, and established personalities in women’s sports in all aspects of reporting, including blogging and video editing. The intent is to give the girls a new outlet, and a way to interact with their communities. Global Girl Media executive director Amie Williams, a film director/producer, said she decided to start the group after a teen she mentored Kenya was gang-raped, one week after South Africa’s December 2007 presidential elections. Many international groups considered the election corrupt, and the girl got caught in the outbreak of violent tribal protests in Nairobi. Because Williams had been a mentor and friend of the girl for three years, she was asked to return to Kenya to lend her support. Surprisingly, the one thing the teenager wanted from Williams was a chance to tell her story on camera. “Kick It Up!” plans to develop a model that could be replicated in other countries, by fostering a community of media bureaus for girls to connect via multimedia platforms on the Web. Funding will be sought via grants, and donations via its website, www.globalgirlmedia.org. The Nike Foundation recently provided a seed grant of $10,000. Kgomotso Matsunyane, one of the few cinematographers based in South Africa, will be a mentor in Soweto. Matsunyane said it is very possible for girls to grow by working with a camera. According to the Human Resource Science Council, South Africa’s university graduation rate of 15% is one of the lowest in the world. Programs like Global Girl could help girls into the male-dominated field of multimedia production. While most girls she’s met want to work on camera, Matsunyane said Global Girl allows young women to choose how their images are portrayed. Julie Foudy, a two-time Olympic gold medalist and former captain of U.S. women’s soccer team, will serve as a spokesperson for the Global Girl pilot project. Foudy will be in South Africa as the only female analyst for ESPN coverage of the World Cup. Foudy said at a kickoff event in New York City that Global Girl’s grassroots beginning is similar to the growth of U.S. women soccer in the late 1990s. The content produced by the girls in South Africa will be distributed to various media outlets, such as ESPN, which is partnering with Global Girl. Other online entities like YouTube, and free daily blogs, will also be used.